Perfect location in old town. Close to free parking and all other amenities. The apartment is very spacious and quiet but quite dark and no wifi. Modern, clean and a good location. Francesco was a great help to us getting settled in and parking the car. The apartment is lovely, spotless and all you need for a comfortable stay. We couldn't recommend Viterbo highly enough. A beautiful medieval city with a vibrant nightlife lovely cafe's and restaurants. We will return for a second visit. The apartment was more spacious than we thought it would be from the pictures. The balcony is perfect for 2 or 4 persons for a drink or a meal. A good sized bathroom with shower. A very large kitchen with all conveniences. The sitting area is also quite spacious. The location is optimal, close to everything. Best of all is the very economical rental cost per night. The owner was at the apartment to greet us and carry our luggage up the one flight of stairs. The owner is very helpful and friendly, but doesn't speak English. It helps to be able to speak a little Italian, but it wasn't a problem. I make just one recommendation which is for Francesco to install WIFI even if it means having to raise the rental cost slightly. WIFI these days is almost a must. But aside from that, we loved the place and when we come back to Viterbo for a longer term we are hoping we can work out an arrangement with Francesco, for a longer term rental. Ospiti molto educati. puliti .puntuali e rispettosi della casa. è stato un vero piacere ospitarli.. The apartment is very well furnished , exceptionally clean and thought out. The hosts were very friendly and helpful. We had a very relaxed time soaking up the Viterbo ambiance. 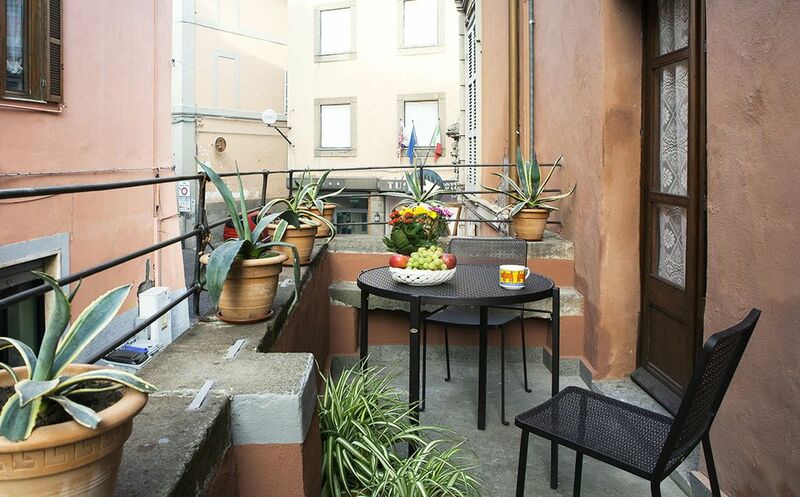 Great location for sight seeing, Rome Tuscania the spa pools, and other fine cities. The apartments balcony was great for chilling out at the end of a busy day, quiet although in the centre of town. Highly recommended to anyone needing a comfortable place to base for sight seeing and holidaying in Lazio, many thanks to our hosts. Una casa en el Casco antiguo de viterbo. Super preparada ; baño de buen tamaño,cocina muy adequada que te permite cocinar sin ningun problema, sofà cama muy fàcil de abrir y cerrar, la habitacion de matrimonio muy confortable. Ha estado una estància genial . El propietario Francesco una persona encantadora que te facilita al máximo la estància. Una casa muy recomendable y cuidada hasta el Ultimo detalle. Gràcies francesco una gran casa. No dudaremos en volver. Ottima soluzione vicina al centro e comoda a tutti i servizi. Dotata di tutto ciò di cui c'è bisogno per un piacevole soggiorno a Viterbo.